Sustainability is achieved at the intersection of social, economic, and environmental factors (see Figure 3.1). Source: FHWA Sustainable Highways Program. For example a project that results in economic development while also benefitting local communities and the environment. If only two out of three overlap, (for instance social and economic), it may result in a situation that is “equitable,” but does not necessarily consider the needs of the environment. Likewise, a situation that balances the social needs with environmental needs may be “bearable,” but may not result in optimal economic gains. Sustainability is a concept that is achieving an increasingly high level of public awareness and interest, and is beginning to shape government transportation and land use policies, particularly through actions such as FHWA’s Livability Initiative. The private sector is also addressing sustainability concepts, with increasing effort being placed on creating efficiencies within logistics supply chains. Though some of this is in response to consumer and government demands, it is also driven internally, by the recognition that increased efficiency often results in cost savings – from reduced fuel consumption, reduced vehicle miles traveled (VMT) and other opportunities. This section discusses the linkages between land use planning and policies on a variety of different aspects of sustainability, including economic development, environmental sustainability and social factors (including livability, equity and justice). For example, in some growing urban areas, local and regional “smart growth” land use policies can result in the relocation of industrial and freight land uses to regional fringe areas, which can result in negative environmental and transportation impacts (increased truck VMT and efficiency) that can run counter to the goals of smart growth. This section also discusses how freight land uses can be integrated into existing land use plans in a manner that maximizes the benefits of freight, while minimizing the negative impacts to communities and the natural environment. Guidance about how to avoid or mitigate the unintended consequences of land use decisions on freight movements is provided. Invest in healthy, safe, and walkable neighborhoods – rural, urban, and suburban. Freight and Land Use Sustainability Issues and Implications – Provides an overview of issues related to freight land uses and the three dimensions of sustainability and identifies the conflicts that can result from land use decisions leading to “freight sprawl” and its impacts on environmental, economic, and social sustainability issues. Sustainable Freight Land Use Strategies – Presents strategies to preserve and restore freight facilities in urban areas and small towns. Examples of freight land use strategies that some areas are exploring and implementing, which uphold the principles of environmental, economic, and social sustainability are discussed in this section. Summary and Conclusions – Reviews the key findings from this section and discusses elements that will be incorporated into final section of this guidebook. Freight transportation and land use systems have impacts on all three dimensions of sustainability – social, environmental, and economic. Issues such as emissions reductions and climate change impacts, job creation and preservation, and community impacts of freight are some of the current issues relevant to freight land use sustainability. This section provides an introduction to the freight and land use issues relevant to each aspect of sustainability and lists the sustainability implications of freight land use trends and decisions. While removing freight land uses from populated areas ensures that there will be fewer freight impacts on communities that abut freight facilities, there are many impacts that such policies introduce or exacerbate, though likely unintentionally. In addition, poor planning for freight facilities located in urbanized areas can result in negative impacts on nearby residents, some of these communities could be low-income or minority populations which brings up environmental justice issues. The potential ramifications of land use policies which exclude freight impact all three aspects of sustainability environmental sustainability, economic development, and social factors. Measures to improve the environmental aspect of freight sustainability seek to diminish the environmental footprint of freight operations. Among other impacts, the movement of freight contributes to regional and local air and water pollution – in particular along high-volume freight facilities, corridors, and at large freight generating land uses. The buildings and infrastructure of freight facilities and operations can disrupt habitat and can contribute to the loss of green and open space. Therefore, efforts to reduce the impacts of freight often focus on the reduction of freight-related emissions, by good site design and practices that minimize the impacts and runoff from freight facilities, by creating more fuel-efficient freight vehicles and facilities, and by recognizing and addressing climate change impacts. “Freight sprawl” can result in greater VMT and related congestion and emissions impacts, as trucks must travel greater distances between port and rail terminals in older industrial areas, and distribution centers and warehouses located farther into the exurban and rural areas. This phenomenon may also result in longer return trips to customers located either in the metropolitan area or other exurban locations. Poorly planned freight hubs and systems create congestion, causing delays and increasing costs for fuel and time. In addition, poorly planned freight systems create congestion that affects other users of the transportation system, increasing delays, fuel use, and costs. The emissions from the movement of freight (PM, Ozone, Carbon Dioxide, and others) directly impact the natural environment, human health, and property. In addition, these emissions also contribute to regional and atmospheric changes that can exacerbate acid rain, ozone depletion, damage to crops, plants, and property, and contribute to global warming concerns. Sprawling land development can result in longer trips (increased VMT) and hence, more PM and GHG emissions. Expanding or relocating freight facilities may require a conversion of land from greenspace to industrial facilities. Greenspace can prevent soil erosion and absorb rainwater, and help to improve drainage and avoid flooding. Trees and shrubs can absorb pollution and reduce the urban heat island effect, and provide a buffer zone that can help reduce noise pollution. In addition, greenspace serves as a valuable recreational space to play, gather, and rest. It has also been shown to raise property values and protect the livability and vitality of communities. Land uses associated with freight facilities and corridors have the potential to negatively impact water supply in several ways. If done improperly, without adherence to environmental regulations, fueling, maintenance, cleaning, and other routine operational activities can lead to pollutants in surrounding surface and ground waters and soils. The land uses associated with freight facilities and movement often consists of large amounts of impervious surfaces which can lead to increased non-point source storm water runoff into surrounding waterways. Though new buildings are typically required to meet specifications regarding runoff and ground cover, many existing facilities may not meet those requirements. Particulate Matter (PM) is divided into two subcategories: PM10 (particles between 2 and 10 microns in diameter); and PM2.5 (particles less than 2.5 microns in diameter). Freight is a significant source of PM. In fact, the transport sector is responsible for over one-half of all PM10 emissions, (U.S. EPA 2005 National Emissions Inventory) and freight sources comprise 51 percent of that total (not including off-road diesel equipment, some of which is used for freight applications). Oxides of nitrogen (NOx) emissions, which, when combined with Volatile Organic Compounds (VOC), light, and heat, produces Ozone. Ozone is a pollutant that is a significant health risk, especially for children with asthma and the elderly. It is also the main contributor to urban smog. Transportation demand management strategies to reduce the amount of vehicle miles traveled (VMT) by offering and incentivizing the use of alternative transportation modes. Transportation system management to improve the efficiency of transportation system operations, reduce congestion and bottlenecks (which can cause emissions “hot spots” from the high concentration of idling vehicles). Advanced vehicle and fuel technologies to reduce exhaust and evaporative emissions from truck, locomotive, and marine engines. Regulatory measures, such as the U.S. DOT and Environmental Protection Agency (EPA) proposed “Greenhouse Gas and Fuel Efficiency Standard” for trucks and buses, the first national standards aimed at GHG emissions. If implemented, the standards could result in significant fuel and cost savings over the life of a truck or bus vehicle. The emissions from the movement of freight contribute to regional and atmospheric changes that can exacerbate acid rain, result in damage to crops, plants, and property, and contribute to global warming concerns. Although there is little documentation of the specific effects of freight movement on climate change, much work has been done on the transportation-sector’s contribution as a whole to global warming, including freight. Source: Cambridge Systematics, Inc. Analysis of U.S. EPA Emissions Data Program. In the long run, climate change may have significant impacts on the freight transportation system as well. Increased precipitation, accelerated relative sea-level rise, and increased intensity of storms, including hurricanes, can negatively affect freight systems by exposing them to higher frequencies of flooding, potential rises in road and rail buckling due to heat, potential increases in subgrade erosion in flooded areas, and increased delays due to inclement weather. Erratic and severe weather affect the ability to move goods and to assure adequate safety in moving freight through the system. Beyond controlling emissions to reduce transportation’s contribution to climate change, the transportation sector will increasingly need to adapt to its effects by designing infrastructure to survive more severe climate conditions, achieving strategic redundancy in the transportation system to allow for the use of alternate routings when weather events or other emergencies compromise components of the system, and including disaster and climate change in scenario and emergency planning activities at the state, regional, and local levels. (“Climate Change Impacts,” U.S. Department of Transportation.) As shown in Figure 3.3, some transportation agencies are taking inventory of freight transportation facilities that are vulnerable to climate change impacts such as rising sea levels and storm surge brought on by hurricanes and tropical storms. Source: U.S. DOT, USGS, 2008. Freight is a tremendously important aspect of any region’s economy. The 2004 Metropolitan Transportation Commission (MTC) Regional Goods Movement Study, for example, found that goods movement industries play a critical role in the economy, and that 37 percent of San Francisco Bay Area economic output is in manufacturing, freight transportation, and warehouse and distribution businesses. (Regional Goods Movement Study for the San Francisco Bay Area, MTC (2004).) These are the sectors employed in the production and movement of products, part, and raw materials. The retreat of freight land uses from population centers could reverse economic development by reducing economic activity in several sectors (such as manufacturing and distribution), and weakening an area’s economic diversity. The economic impact would extend to social impacts, as the retreat of industrial facilities would remove employment opportunities for area residents and potentially affect access to products. When a former industrial facility is redeveloped into a residential or recreational facility, the new residents may experience substantial impacts, such as pollutant emissions, noise and light pollution, etc., from the remaining freight activity. Additional encroachments may change the character of the neighborhood from industrial to residential and threaten the viability of the remaining industrial uses. The social dimension of sustainability takes on the need to address human needs fairly and efficiently. (“Policy Guide on Planning for Sustainability,” American Planning Association.) This relates to livability and human rights issues and achieving better standards of living for disadvantaged populations while enhancing the quality of life of all populations. With respect to freight and land use, social issues can be apparent in negative freight facility and transportation impacts on residential areas, including those that impact disadvantaged populations. The location of freight facilities may also negatively affect workers’ access to jobs, especially for workers who do not have access to a personal vehicle and must rely on public transit. Accessibility within communities for delivering products is also important to livability (safety, etc.) and availability of essential products at reasonable costs. Sustainable freight land use practices that address these issues are presented later in this section. The (re)location of freight facilities from urban corridors can result in negative transportation impacts. For example, it may increase the vehicle miles traveled by trucks which have to dray freight between terminals such as ports, airports, and intermodal terminals and distribution centers or receivers. If these facilities are located far apart, trucks have to travel longer distances. In addition, locating facilities away from urban corridors could result in a smaller local labor pool and potentially long commutes for employees traveling from urban areas or small towns farther away In addition, the lack of transit service may make it difficult for employees who lack access to a personal vehicle. Environmental Justice (EJ) refers to equitable distribution of benefits and burdens of government policies, programs, and investments, and the avoidance of disproportionate burdens on low-income and minority populations. Often, freight facilities are located near communities whose populations are predominantly low-income and/or minority. While freight facilities provide employment opportunities and local tax revenue, the external impacts on nearby communities should be reduced or mitigated. Rail safety concerns tend to be concentrated around at-grade crossings (where the potential exists for vehicular/train interactions) as well as the issue of rail carrying HazMat material. Pipelines carrying oil and other potentially hazardous material traverse through residential areas, creating a situation that is generally safe, but has the potential for catastrophic incident. Congestion is a recurrent problem in many regions throughout the nation. Apart from the economic cost of time lost to delay, there can also be public health consequences. Traffic congestion has been linked to negative health effects caused primarily by stress – hypertension, headaches, and weakened immune system. Air pollution from transportation sources presents a health risk as well. Emissions of nitrogen oxides and volatile organic compounds (VOC) in diesel fuel transform into ozone, which contributes to the buildup of greenhouse gases (GHG) in the atmosphere and could contribute to climate change. Particulate matter from road dust and engine exhaust can be a contributing cause for asthma. Noise pollution is described by the EPA as “unwanted or disturbing sound.” In terms of freight movement, noise pollution complaints generally focus on truck sounds (including braking, loading, and engine sounds), train whistles, horns and movement, the sound of air cargo planes, or the sounds that tend to accompany industrial land uses. Noise pollution can have major consequences to people’s health. Problems can include annoyance, sleep disturbance, reduced productivity, hearing loss and tinnitus, cardiovascular disease, and effects on the immune system, among others. Noise induced Hearing Loss (NIHL) is the most common health impact, though research has shown that there are numerous other negative impacts on public health. The San Pedro Bay Ports Clean Air Action Plan (CAAP) is an emissions reduction plan adopted by the ports of Los Angeles and Long Beach to improve air quality in the Los Angeles basin by implementing strategies to reduce port-related emissions from ships, trains, trucks, terminal equipment, and harbor craft. Although the San Pedro Bay ports are a significant source of diesel emissions in the region, the Federal and state governments have no authority over many port emissions sources (such as foreign-flagged vessels), so the ports can employ emissions strategies that other entities cannot. The CAAP is a collaborative program that has been endorsed and adopted by both ports. Getting both ports on-board was critical because port tenants need assurance that they would not be subject to different requirements at each port. The plan also has the support of the South Coast Air Quality Management District, EPA, and California Air Resources Board. The CAAP is a five-year plan, but it also has a long-term component that describes how five-year emissions reduction actions would be integrated into port operations over the long term, and their expected impact on emissions. The plan targets PM emissions, but SOx and NOx reductions are secondary goals. Tenant Leases. Whenever new development occurs on port property, the port works with the tenant to put mitigation measures into the lease. When port tenants amend or renew their leases, the port must comply with the California Environmental Quality Act (CEQA) and the NEPA (if applicable). The CAAP serves as the guiding document for developing mitigation strategies during the Environmental Impact Statement (EIS) and the state-required Environmental Impact Report (EIR) phases of the project. The port then negotiates with the tenant to incorporate feasible mitigation measures into the lease. Measures that are not feasible for the tenant to undertake become the responsibility of the port. Examples of mitigation measures placed in a lease include requiring the use of shore power by ships berthed at the terminal and tenant adoption of clean yard equipment. Incentives. The ports provide monetary incentives to retrofit older trucks accessing the terminals with emissions control devices, or replace them with new, cleaner models. This approach has been effective since trucks often access multiple terminals and are outside of the control of any one tenant. There also are incentives to use ultra low sulfur diesel (ULSD) and to reduce vessel speeds when approaching the ports. Tariffs. The CAAP calls for tariff changes to encourage the adoption of emissions reduction strategies by vessels calling on the port, but to date these have not been implemented largely because of the economic downturn. To offset sprawl, urban and small town disinvestment, and related impacts, many local and regional government agencies are adopting sustainable land use strategies, including strategies to accommodate freight in urbanized areas, and to develop freight facilities in clusters, to reduce the environmental and community impacts while providing benefits from freight transportation (cost of goods, accessibility of goods, accessibility of jobs) In addition to the “good neighbor” strategies such as efficient truck routing and facility design to avoid and minimize neighborhood impacts identified in Section 2.0, examples of sustainable freight land use strategies include industrial preservation, brownfields redevelopment, and freight villages. One sustainable practice is to implement strategies that preserve the viability of existing freight land uses. It is important for cities and towns to maintain a mix of land uses and to provide employment opportunities for residents and accessibility for goods movement. Industrial areas can be preserved by designating manufacturing or industrial districts. Such district designations ensure that there is a “place” for such land uses in the municipal code. The designations can be accompanied with zoning codes that ensure that industrial land uses remain separated from incompatible land uses, and to restrict the encroachment of residential and other incompatible uses on the industrial districts. This could include form-based zoning or performance zoning, (Detailed description of different types of zoning codes, including Zoning Overlay Districts, form-based zoning, and performance zoning is included in Chapter 3 of this Handbook, Section 3.1.) the latter which specifies the intensity of land uses that are acceptable. A good example of this is the City of Chicago, (Chicago Metropolis 2020: The Metropolis 2020 Freight Plan: Delivering the Goods, 2004.) which has designated 35 industrial corridors, a designation that commits the City to maintain infrastructure and zoning that supports industrial activity along the corridors. As part of this, a special zoning designation called “Planned Manufacturing Districts (PMD)” was developed. PMD is a special zoning designation for a defined geographic area that limits the types of development that may occur in the area to industrial activity and other compatible land uses. Ten PMD sites have been identified along the 24 corridors. Any industrial zoning code should also include provisions that require context sensitive solutions, such as lighting requirements, buffers, etc., (as recommended in Section 2.0) to limit the external impacts of freight and industrial land uses on adjacent land uses. Additionally, it is important to preserve freight access to multiple modes of transportation, for the sake of transportation system redundancy, freight transport efficiency, and modal balance. Therefore, freight land uses with a combination of highway, rail, water, and air access offer particularly strategic opportunities. Seattle, Washington: The PSRC VISION 2040 demonstrates how proactive land use planning can shape a desired future scenario for freight land uses and preserve the viability of those uses in an urban environment. VISION 2040 is a regional strategy for accommodating an additional 1.7 million people and 1.2 million new jobs expected to be in the region by the year 2040. The plan is an integrated, long- range vision for maintaining a healthy region – promoting the well-being of people and communities, economic vitality, and a healthy environment. It contains an environmental framework, a numeric regional growth strategy, and six policy sections guided by overarching goals. Recognizing that industrial land uses generate a significant share of the region’s employment, VISION 2040 designated 21 desired growth areas, including 8 industrial and manufacturing centers. The industrial and manufacturing centers are areas in which clusters of freight generating industries are located. One goal of VISION 2040 is to preserve the industrial and manufacturing centers, and to continue to provide adequate public services. VISION 2040 includes an implementation strategy, which will monitor the vital signs of each of the industrial and manufacturing centers (such as employment, number of facilities, etc. ), comparing them to performance goals, and evaluating the success of the implementation program. While much of the growth in freight land uses in recent decades has occurred at the fringe of metropolitan areas throughout the country, there are increasing pressures to develop or redevelop industrial and distribution land capacity near major seaports, intermodal terminals, and other freight hubs, which are often located in urban areas, to support growing international trade and domestic consumer demand. Brownfields, which are abandoned, vacant, or underutilized industrial parcels, represent opportunities for redevelopment to accommodate growth in freight land use demand. Many freight developers are recognizing the transportation costs associated with serving markets from distant facilities and desire locations closer to major freight terminals and consumer markets. Planners are recognizing the potential to restore urban and small town employment and opportunities to clean up contaminants that present health and environmental hazards and to restore sites to active use. Developing or redeveloping brownfield sites for modern freight-supporting uses such as industrial or distribution centers does not come without challenges, since many brownfields may be desirable to residential developers, especially in waterfront locations or areas in close proximity to downtowns. It is important that planners recognize that in some cases, “highest and best use” does not mean luxury residential development, but that supporting freight facilities is of importance to a municipality, county, and region. Source: North Jersey Transportation Planning Authority and New Jersey Institute of Technology, 2001. A freight village is a defined area, often master-planned, within which all activities relating to the transport, logistics and distribution of goods are carried out by various operators. Freight villages are effectively clusters of freight and logistics facilities where any number of supply chain activities (such as consolidation, value-added activities, and transloading) occur within the boundaries of the district. Often, freight villages include support services such as truck rest areas, banks, customs for international cargo, restaurants, and vehicle repair services. Freight villages come in many shapes, sizes and combinations of facility types, and can be applied in urban and suburban environments. The freight village concept originated in Europe in the 1960s, and includes examples in Barcelona, Paris, and The Netherlands. Alliance, Texas is a good example of an existing “freight village” in the United States. 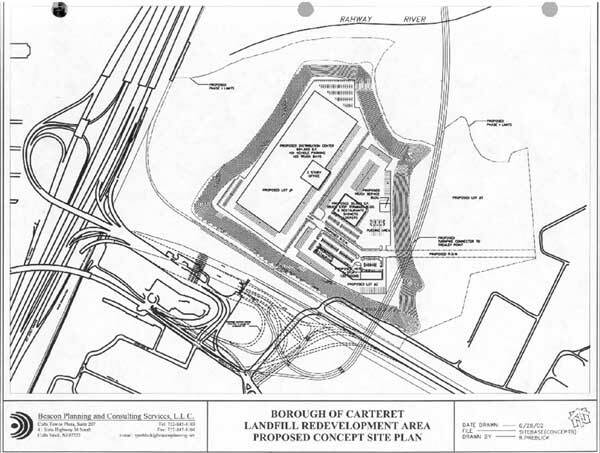 Several addition freight villages are also under consideration, including a potential freight village at Tremley Point in Linden, New Jersey and a possible Harlem River freight village in the Bronx in New York. The NJTPA and NJIT Brownfield Economic Redevelopment Study identified public sector initiatives that could help spur redevelopment of many abandoned and underutilized industrial sites in the region. Recognizing that “freight sprawl” was having a noticeable impact on traffic congestion and quality of life in the northern New Jersey region, and anticipating a significant increase in port-related freight volumes traveling into the region (which would require more freight-supporting land-uses), the NJTPA and NJIT conducted a study to identify the potential for redeveloping brownfield industrial sites near the port terminals and the region’s population core. The study quantified the expected growth in container traffic and the associated demand for warehouse and distribution space, and gave specifications for the needs of modern facilities. An analysis of potential sites and government land use and environmental policies identified the potential for redeveloping brownfield sites in the region. The study found that at least 2,500 acres of brownfield sites suitable for freight-related redevelopment existed within just 10 miles of the seaport, and thousands of additional acres existed up to 25 miles away. The sites ranged in size from a dozen to more than 100 acres, and many had desirable highway access and were located away from sensitive residential land uses. The study showed that while some state policies encourage brownfield redevelopment (such as a fund that reimburses developers up to 75 percent of the site cleanup costs), there are many barriers to redeveloping brownfields, including a lack of coordination between government agencies at the state and local levels, conflicting requirements, delays caused by multiple reviews, and high costs for permitting and plan approvals. The study recommended policy changes and a number of transportation, environmental and planning recommendations to facilitate brownfield redevelopment. The NJTPA and NJIT Brownfield Economic Redevelopment Study is an example of a regional visioning and planning tool to help the region identify the potential for reclaiming fallow industrial lands and to accommodate freight land uses in a more sustainable configuration. The private sector is increasingly addressing sustainability concepts, with special focus on creating efficiencies within logistics supply chains. Though some of this is in response to consumer and government demands, it is also driven internally, by the recognition that increased efficiency often results in cost savings – from reduced fuel consumption, reduced truck VMT and other opportunities. The environmental component of sustainability includes impacts to the natural and human environment. The movement of freight contributes to regional and local air and water pollution, can disrupt habitat, and can contribute to the loss of green and open space. In addition, freight emissions comprise close to one-third of U.S. transportation GHG emissions, and have grown by more than 50 percent since 1990. (Federal Highway Administration. Freight and Air Quality Handbook, May 2010.) GHG emissions have been linked to environmental trends, including global warming, sea-level rise, and increasingly unpredictable weather patterns. Emissions from the movement of freight can have serious impacts on public health. The presence of emissions have been linked to health conditions, including: reduced lung function, asthma and other respiratory illnesses, increased risk of cancer, and premature death (especially in vulnerable groups such as children and the elderly). The economic component of sustainability strives to achieve an economic model in which the actions taken in the present will not diminish the prospects of future generations to enjoy the levels of consumption, wealth, utility, or welfare enjoyed in the present. This is a particular challenge, as many local and regional plans tend to focus on short-term economic development (job creation) and growth. The social dimension of sustainability takes on the need to address human needs fairly and efficiently. (“Policy Guide on Planning for Sustainability,” American Planning Association.) This dimension relates to livability and environmental justice issues and achieving better standards of living for disadvantaged populations while enhancing the quality of life of all populations. Important issues include ensuring the safety of the movement of freight, as well as minimizing the noise, light, and air pollution from freight land uses on their neighbors and providing access to affordable goods. Many local and regional government agencies are adopting sustainable land use strategies, including strategies to accommodate freight in urbanized areas, and to develop freight clusters in a manner that reduces the environmental and community impacts. In addition to the “good neighbor” strategies such as efficient truck routing and facility design to avoid and minimize neighborhood impacts identified in Section 2.0, examples of sustainable freight land use strategies include industrial preservation, brownfields redevelopment, and freight villages. You will need the Adobe Reader to view the PDFs on this page.